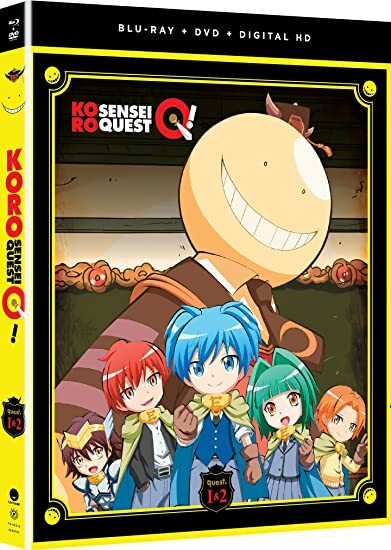 Koro Sensei Quest: Shorts - BUY THIS BLU-RAY! "Get ready for an epic quest—the killer class is back, but this time they’ve got…magic?! It’s time for a fun-sized adventure with your favorite group of assassins! Join the chibi students of the E Class as they work their way through dungeons to defeat the Big Bad, aka the Demon King Koro Sensei. But their skills aren’t quite where they need to be, which means they’ll take lessons of swordsmanship and sorcery from the Demon King himself. Will they finally level up or suffer game over? As they face familiar foes, they’ll gain the experience points they need to finally take on Koro Sensei—that is, if their bugs don’t get in the way! Cursed with nasty little quirks, they’ll endure misplaced aim, missing clothes, falling pans, and more annoying mishaps as they make their way towards the final boss." THEN SEND IN A COMMENT ABOUT YOUR FAVORITE FUNIMATION TITLE (you may click on artwork above for a refresher) PLUS YOUR NAME AND ADDRESS TO contests@efilmcritic.com or WeLoveHBS@aol.com. (Just one e-mail please.) Put [b]"KORO'S SENSEI HAS A SHORTS PROGRAM" in the subject line and cross your fingers. We will draw names and one of the prizes could be yours. Only 1 entry per household.